A dramatic climate event at Star Carr, Yorkshire, had no substantial impact on human activity. Pioneering early people who lived at the end of the last ice age actually carried on with life as usual despite plummeting temperatures, according to research focused at a world-famous archaeological site in North Yorkshire suggests. Leading researchers, based at Royal Holloway, University of London, the University of York and the University of Southampton, found that a dramatic climate event with a sudden drop in average temperatures, severe enough to halt the development of woodland, had no substantial impact on human activity at Star Carr – a middle Stone Age archaeological site dating to around 9,000 BC. The study, published in Nature Ecology & Evolution, sheds new light on significant debate about the sensitivity of hunter-gatherer societies to environmental change. The rich archaeological record at Star Carr gave the researchers the rare opportunity to directly compare the palaeoclimate record with evidence of human activity through time in the same location. The prehistoric community, who persevered through the cold snap that would last more than 100 years, left a plethora of worked wood, animal bones, antler headdresses and flint blades buried in layers of mud as evidence of their continued productivity and endurance. The team identified two episodes of extreme cooling which saw average temperatures drop by more than 3 degrees in the space of a decade. The first of these events occurred very early after humans began to return to the area after the last ice age. The evidence indicates that these conditions may have slowed down the progress and activity of a community in the nascent stages. However, the second of these events, which occurred later when the community was more established, appears to have had very little impact. Southampton researchers Pete Langdon, Professor of Quaternary Science in Geography and Environment, and Dr Catherine Langdon, Visiting Research Fellow within Geography and Environment, provided the analyses of prehistoric fossil insects (chironomids – non-biting midges) which led to the summer temperature reconstructions. These were then compared with another proxy measures of past climate (oxygen stable isotopes) to understand fully the climate around the time of the human occupations. The early Holocene, the current geological epoch which started some 11,500 years ago when the glaciers began to retreat, was dominated by climatic instability characterised by extreme weather events triggered by ice-ocean interaction during the final wastage of the northern hemisphere ice sheets. 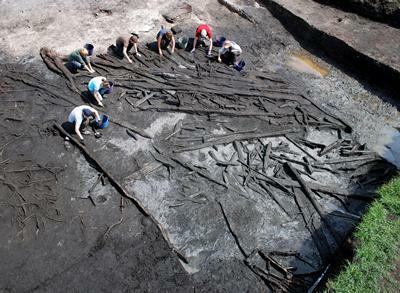 The researchers examined human activity by looking at archaeological remains recovered from layers of wetland deposits at the edge of the extensive former lake basin in the Vale of Pickering. They found evidence of houses, large wooden platforms built on the lake edge and large quantities of artefacts and bones preserved in the lake muds and these were radiocarbon dated. Pollen, macrofossils and isotopes taken from lake sediment cores allowed the researchers to build a high-resolution picture of the climate of the area over thousands of years. Simon Blockley, Professor of Quaternary Science at Royal Holloway and lead author of the study, said: “It has been argued that abrupt climatic events may have caused a crash in Mesolithic populations in Northern Britain, but our study reveals, that at least in the case of the pioneering colonisers at Star Carr, early communities were able to cope with extreme and persistent climate events. “We found people were in fact far more affected by smaller, localised changes to their environment - Star Carr was once the site of an extensive lake and people lived around its edge. Professor Nicky Milner, senior author based at the University of York, added: “Perhaps the later, more established community at Star Carr were buffered from the effects of the second extreme cooling event – which is likely to have caused exceptionally harsh winter conditions– by their continued access to a range of resources at the site including red deer. “We have been working at Star Carr for about 15 years and the site has produced an incredibly rare glimpse into the world of our Mesolithic ancestors who lived at the end of the ice age, about 11,000 years ago. ‘The Resilience of Postglacial Hunter-Gatherers to Abrupt Climate Change’ (DOI 10.1038/s41559-018-0508-4) is published in Nature Ecology & Evolution. The work was funded by the European Research Council, Historic England, the Natural Environment Research Council, The British Academy, The Vale of Pickering Research Trust, and the Universities of York, Manchester and Chester.